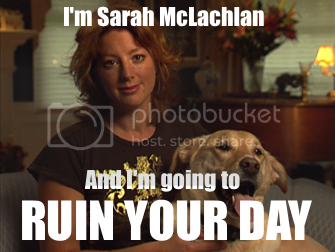 For years, we as a society have been plagued with the major buzz-kill of the infamous Sarah McLachlan commercial. You know the one. The one they slide in between a Snuggie commercial and Friends reruns and makes you want to cover your ears and sing "LALALALALA I CAN'T HEAR YOU!" like you did when you were 5? The worst part is there are now TWO. The second features Alyssa Milano (of...something fame...early 90's, I wanna say?) and is essentially the same commercial only without the haunting melody, and change the puppies to children. Sarah. Alyssa. Stop making me feel like a jerk because I automatically mute the TV or change the channel any time your commercials come on. Don't look at me that way. It's like your eyes are boring into my soul saying, "WHY DO YOU HATE THE CHILDREN? WHY, LAURA? DON'T YOU SEE THIS PUPPY'S SAD EYES? THEY'RE AS BIG AS SAUCERS AND WELLING WITH TEARS AND INNOCENCE! WHY CAN'T YOU JUST GIVE UP 50 CENTS A DAY TO HELP THESE SAD CHILDREN AND PUPPIES LIVE? Fine, just go drink your Starbucks in front of your Macbook and try not to think about your material abundance in the midst of such poverty. Go ahead." As a side note, what are the requirements to be the spokesperson for one of these commercials? Does it just have to be a person who has faded enough from celebrity status that they are available, but not so much that no one will recognize them? Full disclosure, I would have never been able to identify Alyssa Milano just by looking at her. The name caption is definitely necessary. 1) The ability to display two quarters between your thumb and index finger like a wheel of fortune model without dropping them or giving in to the temptation to rub them together like an old-timey mobster trying to decide which table to gamble on. 2) The ability to hold a very concerned facial expression for the duration of at least 1:30 straight--not many people can do that. it's a very underestimated skill. Apparently Alyssa and Sarah can do it. 3) Super dramatic acting skills, and in this case, the pets in the commercial are no exception. I have reason to believe they must all be graduates of the Guilt-trip School of Dramatic Tricks (For Pets and Other Fuzzy Animals), sponsored by PETA. And the aforementioned C-list celebrity status, of course.